OK! First off, this isn't a moment to judge which one is best, I don't care. I personally love them all. 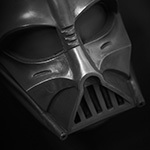 ...yes, even the EFX - not a fan of the company, but I do like the FG Vader lid. What I'm curious about, are they the same size? Just wondering if all three are essentially the same size, or if there are significant size differences. If you do have a photo and don't want to share it publicly, could you PM me the photo? It won't go public - this is just for my own curiosity. TM original face mask sizes varied between castings/moldmakers, the orignals were slightly warped. The SL face is much the same as the EFX, fractionally bigger. The dome is more rounded on the EFX and the SL is tighter in the dome cap. the flaring on the flanges differ. Much more detail on the SL where as the EFX is toy like and it has been cleaned and features a more inaccurate but sharper Y crease in the peak. Very doubtful owners could make direct photo comparisons that show this as you normally have both TM and SL agreements . All 3 could make an impressive Vader but you would need much bigger mods to an EFX and I would imagine much skill to pass it off as a finished and accurate Vader. Even then. Bare in mind the SL face also has it's flaws. I'm not going to state what they are. As does the TM. Measurements are fractionally larger on an SL face. We are talking small measurements that are barely noticed. Only interested in the size comparison of the TM and the EFX faceplates and how they relate to the dome. Nothing more. Not interested in detail comparisons. It's for my own curiosity since I paired the Efx dome and the TM faceplate up - which I definitely (personally) like. ...my mind tends to wander, so I ask questions. Paul is right. But keep in mind the production EFX's are at least an extra generation down from any SL or TM copy. 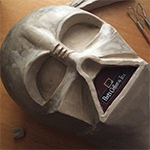 They would have taken the master, molded it, taken a copy to modify, mold that, then have the production copies. So the EFX is actually noticeably smaller than a TM or SL. I have a comparison thread of the SL and EFX here. I have a comparison thread of the SL and EFX here. Totally agree with darthvaderv and sithlord.The SL and the TM masks are practically identical.